ERDOS, China -- Shenhua Group Corp., one of China's coal giants, has built much of its success at the cost of climate change. Every year, the company digs hundreds of million of tons of coal out of the ground and sells this carbon-intensive energy source throughout China. But now, Shenhua is shifting its course. The clue is hidden in a coal-to-liquids plant here, deep in northern China's Gobi Desert. Workers heat, pressurize and process coal into diesel and other needed fuels, leaving liquid carbon dioxide as a byproduct. Then big refrigerated tank trucks drive in and carry that byproduct to a hillside 10 miles away. 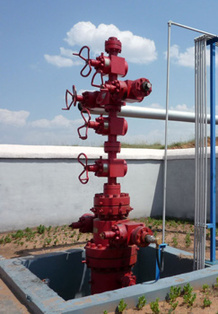 A "Christmas tree" valve tops an injection well containing 46,000 tons of CO2 removed from the process of converting coal to liquid fuels. Photo by Coco Liu. The amount of released CO2 that Shenhua has prevented seems small, but it is a symbol of China's continuing efforts to develop a cutting-edge technology it calls carbon capture, utilization and storage, or CCUS. China started a few years ago and now has several pilot projects using different techniques running across the nation. A few hundred miles south of Shenhua's project, another Chinese energy giant, ENN Group, is betting on a green, single-celled organism to reduce carbon emissions. In a greenhouse-like lab, carbon dioxide captured from a nearby coal-fired power plant flows into hundreds of tubes and becomes an essential food supply for microalgae. While devouring one of coal's pollutants, the oil-rich algae can later be used to make biofuel. And in Beijing and Shanghai, China Huaneng Group Corp. equipped its coal-fired power plants with carbon capture systems and sells the captured gas to makers of soft drinks. The move was at the government's order to green the image of the Beijing Olympics and Shanghai World Expo. The company continues to push forward, planning to trap 60 percent of carbon emissions in its Tianjin-based newly built power plant by 2016. Much is expected of CCUS technology. Companies here hope to use it to cope with China's tightening greenhouse gas regulation. Politicians and climate activists view it as an answer for a crucial question: How can a country that largely runs -- and will continue running -- on coal make its contribution in the battle against climate change? China has long been hooked on coal. In 2009, it consumed almost as much coal as the rest of the world combined. And although the nation in recent years has been pushing hard to use other energy means, installing more wind and hydro power than elsewhere, experts say that won't shake coal's position as king of China's energy. But reducing China's own emissions might be a beneficial side note to a larger aim: marketing CCUS technology to other countries. Beijing has set its mind on becoming a leader in CCUS. "The Chinese government has been actively pursuing and supporting a technology development agenda that very quickly allowed China to make a breakthrough in the new generation of various technologies, and carbon capture and storage technology development was at first riding on this wave," said Ellina Levina, an energy analyst at the International Energy Agency. Beijing appears to be getting closer to that goal. "Lower cost structure and short timelines for project approvals and construction provide the rationale for a positive outlook on carbon capture and storage development in China compared to other parts of the world," Levina added. "If this dynamic continues, China has the opportunity to become an exporter of carbon capture and storage technologies." Already, there are early signs of such a trend. Chinese utility company Huaneng and U.S. company Duke Energy Corp. signed a cooperation agreement this year calling for a study to determine the feasibility of applying Huaneng's carbon capture process at Duke Energy's coal-fired power plant in Indiana. "Huaneng is a global leader in several areas of CCUS," said Julio Friedmann, chief energy technologist at Lawrence Livermore National Laboratory, who helps assess the technology. 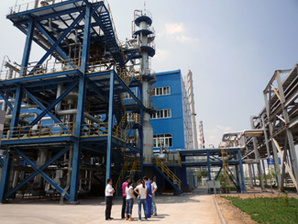 In carbon capture, the core of this expensive technology, statistics show Huaneng has already managed to reduce the cost to a level that seems beyond some of its peers. Compared with coal-fired power plants, coal-to-chemicals factories capture CO2 from industrial waste more easily. That is because more than 80 percent of their industrial waste is carbon dioxide; by contrast, the figure is less than 20 percent in the power plants, said Wang Yongsheng, engineer of Shenhua's carbon capture and storage project. "The difference between coal-fired power plants and coal-to-chemicals factories is that they capture CO2; we capture impurities," Wang jokingly said. An engineer explains the coal-to-liquids process at the blue-walled plant in Erdos, China, to an outside group. Photo by Coco Liu. Due to rising prices of crude oil, a traditional raw material used to make chemicals, the number of factories that produce chemicals out of coal has surged nationwide. So has the amount of carbon dioxide they emit. China's coal-to-chemicals industry currently accounts for 3 percent of the country's total emissions. And by 2020, its emissions could grow four times, if all the applied projects get the go-ahead from the government, said Tian Yajun, a researcher at Shenhua's National Institute of Clean and Low-Carbon Energy. Policymakers are aware of this threat. The National Development and Reform Commission, China's top-level state planning agency, said in 2009 that all the new coal-to-chemicals factories in China will need to submit plans on how to reduce their future emissions when applying for construction permits. But Shenhua won't go too far. Its coal-to-liquids plant in Erdos emits more than 2 million tons of carbon dioxide each year; only 5 percent of that is being buried underground. What has stopped the company from burying more of the gas or expanding the technology into more of its plants is simply the lack of money. Already, the buildup of Shenhua's 300,000-ton carbon capture and storage project has cost more than $32 million. And for every ton of carbon dioxide it captures and stores, the company pays $47. The Chinese government has subsidized part of this investment. But most of the project cost is still paid for from the company's own pocket. To be sure, Shenhua has little intention of pouring all of its profits into carbon capture and storage. "Lacking economic incentive is the biggest hurdle for the development of carbon capture, utilization and storage technology," Sung said. "Companies don't do things that they cannot make money from." Then there are environmental concerns. In a report issued in 2009, Greenpeace International called carbon capture and storage technology a "false hope" to save the climate, saying that "safe and permanent storage of CO2 cannot be guaranteed."